There is no “one size fits all” when it comes to mobile operating systems (OS) and the announcement by Microsoft of Windows Phone 8 will soon give customers another choice when shopping for a new Verizon Wireless smartphone . This new OS brings new features to explore and new ways to further personalize your smartphone. Windows Phone 8 will debut on a number of new smartphones. The Start screen is always the most personal screen and Live Tiles on Windows Phone 8 makes that personalization possible. Live Tiles let you create a Start screen that’s exactly right for you by letting you not only pin apps but also people, bookmarks and more all on one screen to view at a glance. The Live Tiles and Apps pinned on the Start screen animate and update as notifications come in so you see which apps are calling for your attention. The tunes that you rock out to and the games that keep you busy go where you go with Xbox Music and Xbox Games. All of this together is what makes the phone, you. Managing data use on a Windows Phone 8 from Verizon Wireless is just as simple and helps relieve the stress of data use. The Data Sense app, exclusive for a limited time, tells you how much data you have used in a given time period. It also allows you to set data limits and even reports how much data each app has used. Data Sense doesn’t stop there, as it has a suite of features like Wi-Fi mapping to find hotspots and compressing images and HTML while browsing the Web to help reduce data usage. Having Microsoft Office Mobile built-in means using Word, Excel, PowerPoint and OneNote from your phone to create, edit and view documents. Windows Phone 8 takes the mobile office farther with SkyDrive integration, including 7 GB of free space, for storing pictures, files and data on the cloud and built-in support for Office 365 for email and SharePoint access. A brand new OS needs a powerful network to run on, and with 4G LTE coverage in more than 410 markets across the United States, Windows Phone 8 customers will be browsing and streaming at blazing speeds. That same Verizon Wireless advantage also includes access to the exclusive apps like VZ Navigator for turn-by-turn navigation and maps with millions points of interest, Backup Assistant Plus to store your contacts and more. Verizon Wireless will soon have three 4G LTE smartphones running Windows Phone 8, two of which will be available in the coming weeks. · Windows Phone 8X by HTC – available by Thanksgiving in Blue, Red or Black color models for $199.99 with a new two year contract. 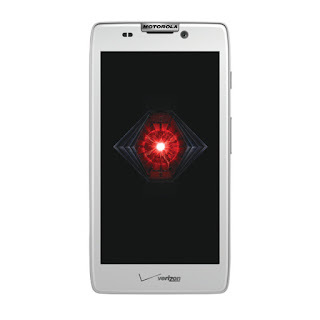 The Red and Black color models are Verizon Wireless exclusives. · Samsung ATIV Odyssey – Exclusive to Verizon Wireless and will be available by the end of the year. More information soon to come. T-Mobile USA has today unveiled its full lineup of smartphones, tablets and services for the upcoming holiday season. 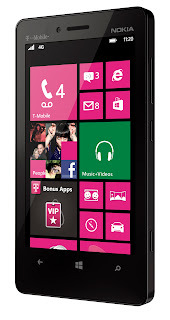 T-Mobile’s portfolio offers the newest Windows Phone 8 devices, including the Nokia Lumia 810 and the Windows Phone 8X by HTC; the Google Nexus 4; and the Samsung Galaxy Note II. 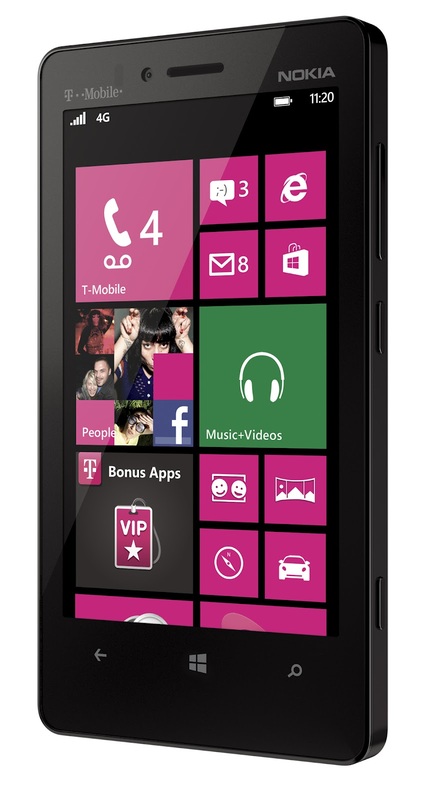 T-Mobile will have two Windows Phone 8 devices - the Nokia Lumia 810 and the Windows Phone 8X by HTC. On the Android side of things, two of the newest options are the Nexus 4 and Nexus 7. The Nexus 4 is the latest device in the Google Nexus lineup, and T-Mobile will be the premier U.S. launch partner. With cutting-edge hardware designed collaboratively by LG and Google, favorite Google Apps, and the latest version of Android, Nexus 4 puts the best of Google in the palm of a customer’s hand. Nexus 4 comes with a high-performance 8MP camera and takes Photo Sphere images to capture every detail of the world. The all-new camera lets customers quickly view and edit photos with powerful new tools, and share favorite shots in a snap. When combined with T-Mobile’s Value plans or T-Mobile’s Unlimited Nationwide 4G Data plan, the Nexus 4 gives consumers a top-notch Android experience. With a 7-inch display, powerful quad-core processor and all-day battery life, the Nexus 7 tablet was built to bring the best of Google in a slim, portable device. With a vibrant, 1280x800 high-resolution display, Nexus 7 brings apps, games, books and movies to life in stunning clarity. Over 1 million pixels in your hand means text is sharper, HD movies are more vivid and gameplay is smooth and dynamic. All of this is protected under scratch-resistant Corning™ Gorilla Glass and designed for the whole family to pass around and enjoy. Nexus 7 was built by ASUS and comes with a NVIDIA Tegra 3 quad-core processor so everything is faster: Pages load quickly, gameplay is smooth and responsive, and running multiple apps is a breeze. For the value-conscious shopper, T-Mobile will offer the LG Optimus L9. Featuring a gorgeous 4.5-inch qHD Corning Gorilla Glass 2 display and equipped with a long-lasting 2150 mAh battery, users can listen to music, explore the Internet or chat with friends and family for hours with just one charge. Further, T-Mobile will continue to offer the Samsung Galaxy S III and Samsung Galaxy S Relay 4G, rounding out a complete portfolio of powerful Android smartphones. T-Mobile will be the first U.S. carrier to preload EA’s Need For Speed Most Wanted game on the Galaxy Note II, including four free events. In addition, this T-Mobile exclusive version of the Need for Speed Most Wanted game on the Galaxy Note II will be optimized to interact with a MOGA™ mobile gaming system, bringing an immersive, console-quality gaming experience to the palms of T-Mobile customers’ hands. The MOGA Mobile Gaming System will be available at www.T-Mobile.com on 10/31 for $49.99 and will be in select T-Mobile retail stores on 11/14. The trend lately has been for smartphones to go bigger, bigger, bigger. So much so, that when you put out a phone like the new Motorola Razr M, with a 4.3 inch screen, it’s considered pretty small by comparison, or at the most medium-sized. The first new release in a line of Razr phones being released this fall (the Razr HD and Razr Maxx HD are also in the lineup), the Razr M aims at the folks who don’t want huge phones – and would rather have something that fits more comfortably in the hand, and also don’t want to spend the big bucks ($199.99 or more out of pocket) that traditionally come with the top new phones. I spent some time with a Razr M, and I’ll let you know what I thought of it. Since the Razr M prides itself on its compactness, of course it comes in a very slim and light package. 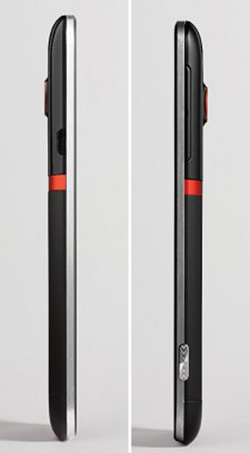 Overall specs are 4.82 inches tall, 2.39 inches wide and a “RAZR” thin 0.33 inches. (Sorry, I couldn’t resist). The weight is just 4.44 ounces, so you’ll barely know you’re holding it. Colorwise, the phone is available in either black or white. This phone is clearly aimed at folks who want a smaller phone that will fit better in their hand and don’t want the megascreens of most competitors. Not everyone will like this. I like the larger screens and found it too small for my tastes, but I know lots of folks who don’t want phones as big as I do. They are the audience for the Razr M.
When you think about it, 4.3 inches seems like a big number. But the much-hyped “edge to edge” design of this phone makes it look and feel more compact than other 4.3 inch screens. As a result, the keyboard is pretty small, bad news for those with big fingers, but you can use Skype to help make typing easier. The materials used are strong and made to last. For example, you get a Kevlar fiber backplate, Corning Gorilla Glass on the display, and an aluminum frame. All these things will make the phone last if it takes a few spills. There is also a water-repellant nanocoating to protect against small liquid spills. One area that disappoints on the Razr M is the display quality. The 4.3-inch Super AMOLED Advanced Display features a resolution of 960x540, which is less than HD quality (You’ll have to go for the Razr HD or Razr Maxx HD to get that.). If you wanted HD quality visuals on a phone, you won’t find it here. Another area that’s not very impressive is the internal storage. You only get 8GB of internal memory, which is weak compared to the competition. You can upgrade to 32GB via microSD card, but you’ll have to buy that separately. This is disappointing, as almost all phones these days come with 16GB of memory included. 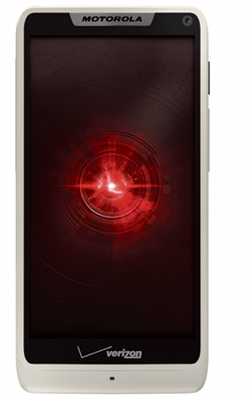 A bonus point for the Razr M is that it features a 1.5 GHz dual-core processor, and 1 GB of RAM. This phone is fast, even if you’re doing some serious multitasking. You’ll also have access to Verizon’s very fast 4G network, so your downloads and uploads will be done before you know it. While my overall experience with this phone was good, there were some things about the operation of the phone that just didn’t feel right for me. A few of the apps and features I tested, including the alarm, were a bit strange in terms of how they were operated and how you can exit out, and a few times I had to restart the phone just to get out of an app that was acting up. — It’s the first Droid phone that’s pre-loaded with the Google Chrome browser, which many people find to be a more effective and enjoyable browser experience. If you want your phone to figure some things out for itself, there is a feature called Smartactions on this phone that lets you do it. It can be set up to adjust battery performance, give you news feeds as soon as the alarm goes off, and shut down non-essential aspects of the phone when you have low battery. This kind of thing is very nice to see, as it can only help people get more battery life out and effective use out of their phones. Like most new Android phones, the Razr M features NFC (near-field communications), which lets you use the Android Beam to share contacts and other data to NFC-compatible phones with just a tap. It’s not something most people use yet, but it’s a cool feature that could become more useful in the future. Between the hundreds of thousands of apps on the Google Play Store, and apps offered on the Amazon AppStore, you won’t have trouble finding whatever type of diversion or work aide or personal app you might be hunting. With rare exception, there is an app for that. After using the Razr M to take photos and shoot video, I found it to be a respectable, but not amazing, camera phone. Many of the shots I got were great, but on average it didn’t measure up to the top phones on the market. A lot of shots were not up to par, but video fared better than still shots – looking crisp. It’s also very easy to share your pictures via Facebook, Picasa, Google +, and elsewhere. The Razr M features Google’s Android 4.0 operating system, which is very easy to learn (and there are on-screen tips if you need some help). In addition to the Google Play store you get all sorts of other Google feature, including: Google Maps with Street View and Latitude; Google Talk with Video Chat; Gmail; YouTube; Google Calendar (which I highly recommend; makes life simpler to organize and it’s all in your pocket), Google+, Google Play Music App (a great way to store music online and have it at your fingertips) and a lot more. You get all the usual messaging options — text, picture, & video — and you have the threaded messaging feature so you can keep your conversations in order. The 2000 mAH Li–Ion battery is non–removable, which is disappointing if you wanted to ever change it out. The life was good, not great; but it got me through the day before needing a charge. Fans of really awesome battery life will want the Razr Maxx HD, but that’s quite a bit more expensive and has a larger screen. Compared to most new smartphone competitors, the Motorola Droid Razr M is quite affordable — $99.99 out of pocket with a 2-year contract. The discount is expected, as it doesn’t quite measure up to the best phones on the market. If you don’t want a contract, it will cost you $549.99 out of pocket. I see this phone having a limited audience (especially with its bigger brothers in the new Razr lineup having better specs), but some of those customers who want this sized phone may jump at it. The weaker points are the screen display quality, minimal internal storage and so-so camera. The high points are the 4G access, the size if that’s what you like, and the overall speedy operation. It’s not a phone I’d pick up due to my larger fingers not being very compatible with the smaller keyboard, but I can see folks with smaller hands giving it a serious look. Another way to look at it is that folks who want to watch movies and videos, etc., on their phones will probably wait for larger screens; but if you’re just using it as a phone, or to send messages and maybe do light web browsing or emailing, it’s probably a good size. I’d say that if this size (4.3 inches) appeals to you more than the 4.7 inches and up phones coming out lately, check it out in the store and see if the size is something you can live with for the next two years. If yes, this might work for you. If not, go for the bigger RAZR phones or another larger model like the Samsung Galaxy S3 or other larger models from Verizon and elsewhere. Matt Myftiu can be reached at matt.myftiu@oakpress.com or 248-745-4617. Follow him on Twitter @MattMyftiu or become a fan of the Facebook page “OPTechTime”. With a couple big name phones from Samsung and Apple currently hogging all the media spotlight, it’s easy to forget that there are other players in the smartphone business that are also making pretty impressive products, too. HTC has never had huge sales numbers in terms of the overall market, but their phones – especially their long-standing EVO line for Sprint – are very good machines that can hold their own with the best of their competitors. I recently tested out the latest EVO phone – Sprint’s HTC EVO 4G LTE , and I’m back with a full report. Keeping with the trend of recent phones, the HTC EVO 4G LTE is big. It’s not Galaxy Note or LG Intuition big, but it’s got a 4.7 inch screen – putting it in a class with the Galaxy S3 from Samsung and towering in size over the 4-inch iPhone 5. I found it to still be small enough that I could hold it comfortably in one hand, but texting will take both hands. I like this size, and the sales numbers on this category of phones prove that millions of others do too. Once you get toward 5 inches and up, it’s too much for me. But 4.7 is just fine. Overall dimensions on the phone are 5.3 inches tall, 2.7 inches wide and a measly 0.35 thick (or more accurately, 0.35 inches thin). So it’s big, but it’s light at just 4.7 ounces. Overall, the materials are sturdy and don’t feel cheap. One very nice feature on the newest EVO is the return of the kickstand. This allows you to prop the phone up and view media, something that’s hard to do on most phones. The kickstand is even a stylish red color. This might seem insignificant to some folks, but if you watch videos or movies on your phone, the kickstand is a very convenient feature to have, and you won’t find anything like it on most phones. One thing that is annoying about this phone is that the battery and SIM card are not removable. Only the top half of the backplate opens up, so you can upgrade your storage via microSD card. But the bottom half with battery and SIM card are not removable. This is a trend in phones I don’t like, and I wish HTC hadn’t gone this route. 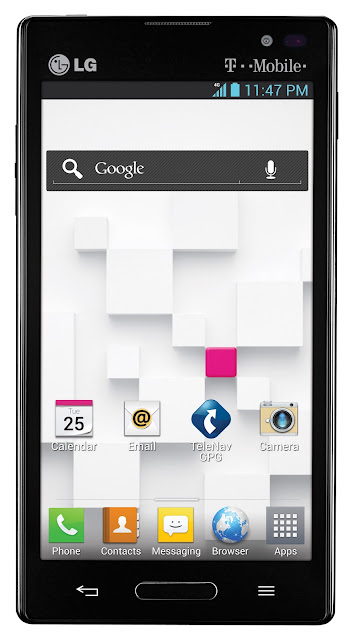 If you’re looking for a nice view on your phone, you’ve come to the right place with the HTC EVO 4G LTE. You’ll get an HD 720p Super LCD screen, and the 4.7 inch size of the screen makes it ideal for viewing games, video and movies. The screen is also very responsive to the touch. You’ll need some power under the hood to be considered a great smartphone these days. And with its 1.5GHz dual-core processor, the EVO 4G LTE is up to the challenge. It was great at multitasking; and at no time did I use the word slow to describe what was happening on the phone. That’s a good sign. You’ll get 16GB of storage on the phone, with the option to upgrade to 32GB if you like via microSD, but 16GB should be plenty for most people. There is 1 GB of RAM, the norm for most top smartphones. All the EVO phones fall under the Android banner. This particular phone runs Android 4.0 (aka Ice Cream Sandwich). There are some nice upgrades here from previous versions of the system, it’s very easy to learn the system and customize your screens, you get great Google integration, and the overall experience of using this phone is very seamless and uncomplicated. 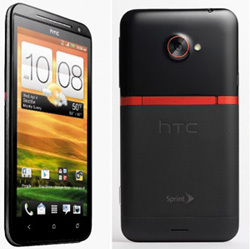 As the name indicates, the HTC EVO 4G LTE is capable of 4G LTE speeds via Sprint’s new 4G LTE network. There’s a catch though; Sprint’s 4G LTE network is not really out there too much yet, so you probably don’t have access to the network. See sprint.com/4GLTE for more info on where the network is. I only had access to the 3G network from Sprint, which is far behind the speeds you get when you are using any 4G network. Until the network grows, this will be a big concern for Sprint, and could drive customers away. If I were them, I’d do it as quickly as possible – they have a long way to catch up to the competition in this area. It also features NFC (near-field communications), which means you can use it together with other NFC-enabled phones to share data with a tap, or make purchases via Google Wallet. You get navigation capability too, via Google maps of course. The EVO 4G LTE’s large screen means there is a large keyboard for easy text messaging. There will be no hunting for tiny keys, especially in horizontal mode, even if you have huge fingers. The rear-facing camera features an 8 megapixel shooter that was pretty impressive, though not the best I’ve seen on a smartphone. I got some great shots, but I also got some blurry ones. The front-facing 1.3MP camera does what it’s meant to do – primarily video chat and self portraits. There are a ton of photo styles and editing options (panorama shots, burst shot, and much more). Video was a home run, as the 1080p high-def video I shot was clear as crystal and very lifelike. Phone videocameras have come a long way, and this one is near the top of the list. If you like to take pictures with your phone, for the most part you’ll be very happy with the EVO 4G LTE. The included 2000 mAh battery (which, as I mentioned, is not removable) was overall very impressive. I got through each day, at least, before having to charge. That can’t be said for all 4G smartphones. This is an improvement from earlier versions of the EVO, which weren’t known for their battery prowess. One of the best benefits of an Android phone is the Google Play market, which offers pretty much any kind of app you might want. It once lagged behind Apple’s App Store, but those days are gone. They are neck and neck at this point. This is the latest HTC phone to feature Beats Audio, which offers slightly better sound quality, but only if you are using headphones. Otherwise, I couldn’t tell the difference. The HTC EVO 4G LTE costs $199.99 out of pocket with a 2-year contract; the standard for top new phones. I would bet that if the competition gets too hot, they might knock the price down a little bit in the near future. There’s a ton of big name competition out there in the smartphone market right now, but to paraphrase a character in Monty Python and the Holy Grail, “HTC’s not dead yet”. HTC is still making very competitive phones, and Sprint is the only one with the EVO line, which has its share of fans. If you are a fan of this line, you might want to stay loyal to it when you upgrade, and they’ve given you a lot to like with the new model. Still, grabbing new customers is going to be hard with all the heavyweights out right now. And the lack of 4G LTE coverage in most places hurts Sprint overall as far as attracting customers. Despite these concerns, there’s no denying, though, that the EVO 4G LTE is very fast, has a solid camera and a lot of other features to like. Whether it worth picking up instead of the bigger-name competition is something each buyer will have to figure out, but one thing’s for sure – HTC has made a phone strong enough that Sprint customers making a choice will have to spend some time thinking about it. For more information on the HTC EVO 4G LTE, visit www.sprint.com. Follow Matt Myftiu on Twitter @MattMyftiu or become a fan of the Facebook page “OPTechTime”. MONROE, Mich. —Verizon Wireless, owner of America’s largest 4G Long Term Evolution (LTE) network, is expanding its 4G LTE service to most of Monroe County, allowing businesses and residents to tap into the nation’s fastest wireless network that now covers roughly 4 out of 5 people in 410 markets across the U.S.
To celebrate the launch of 4G LTE in Monroe, Verizon Wireless will donate $4,000 to Family Counseling and Shelter Services, which provides advocacy, safety options and support services to survivors of domestic violence and sexual assault. The gift was made possible by HopeLine® from Verizon, which converts no-longer used wireless phones into support for survivors of domestic violence. "Now more than ever, domestic violence survivors and victims of abuse need access to our services," said Kathryn K. Slusher, executive director of Family Counseling Shelter Services of Monroe County. “This generous donation from Verizon Wireless will help FCSS continue to advance its mission of empowering people to create violence-free communities." Within Verizon Wireless’ 4G LTE service area, Verizon customers with 4G LTE-enabled devices can stream video, share music and photos, surf the Web and downloadfiles at speeds up to 10 times faster than customers on 3G networks. For businesses using the network, the increasing spread of broadband connectivity provides the most sophisticated wireless capabilities for economic advancement. Verizon first introduced its 4G LTE network in Michigan in late 2010 to parts of Oakland and Macomb counties. Since then, the company has expanded its 4G LTE network to include the following markets: Ann Arbor, Battle Creek, Bay City, Flint, Grand Rapids, Houghton, Kalamazoo, Lansing, Marquette, metro Detroit, Midland, Mt. Pleasant, Muskegon, Port Huron, Saginaw and Traverse City. The company plans to offer full nationwide coverage everywhere it has 3G coverage today by the end of 2013. For more information about Verizon Wireless 4G LTE network, please visit www.verizonwireless.com/lte. After last month’s launch of Motorola’s Droid Razr M, l two more DROID RAZRs will arrive – DROID RAZR HD and DROID RAZR MAXX HD are being offered on Verizon. The most compact 4.7-inch smartphone, Droid Razr HD is built with Corning Gorilla Glass and DuPont KEVLAR fiber. And to defend against the occasional spills and splashes, there’s a protective layer of water-repellant nanocoating. 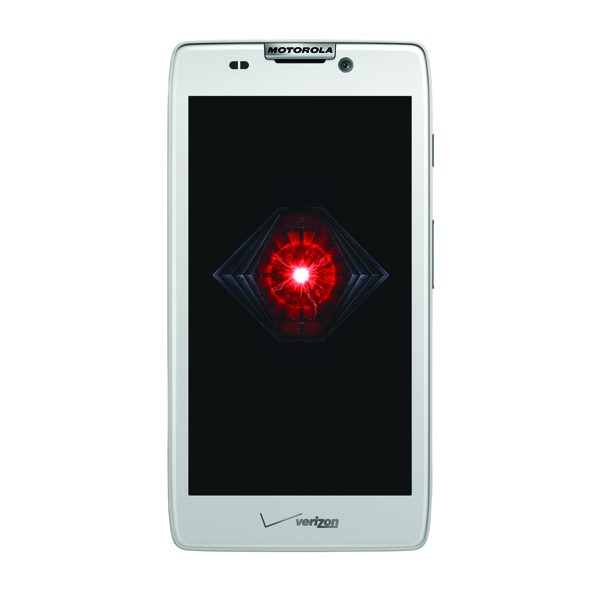 DROID RAZR HD features an 8-megapixel camera and an HD display that makes movies, photos, magazines and websites appear with vibrant clarity. The Circles Widget makes it easy to view battery life, text notifications, missed calls or weather updates, right on the home screen. The smartphones are NFC-enabled, so customers can use Android Beam to share contacts, documents and maps directly to compatible phones. Both new DROID RAZRs run over 4G LTE, combined with Chrome for Android, meaning customers can enjoy blazing fast speeds that make downloading documents or surfing the Web a breeze. Also, both devices are Global Ready, so calling home or sending emails is possible from more than 205 countries around the world. 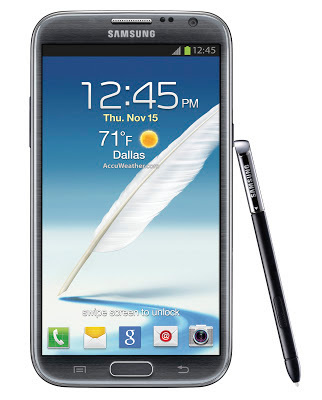 T-Mobile and Samsung today announced the upcoming Samsung Galaxy Note II. The new smartphone features T-Mobile’s largest smartphone screen — a 5.5-inch HD Super AMOLED screen — for an enhanced entertainment experience and improved productivity while using the device. The Galaxy Note II is T-Mobile’s first device with a quad-core processor, featuring Samsung’s 1.6GHz quad-core Exynos processor. In addition, the Galaxy Note II is T-Mobile’s first smartphone shipping with Android 4.1 Jelly Bean and the device’s 3100mAh battery powers up to 15 hours of talk time. “The Samsung Galaxy Note II is the latest innovative device to join T-Mobile’s portfolio. It takes the all-in-one device concept to the next level and we anticipate it will replace many standalone devices consumers have today,” said Brad Duea, senior vice president, product management, T-Mobile USA. Only T-Mobile Galaxy Note II customers will have access to an exciting new racing game preloaded on the device, which will include three free levels. In addition, T-Mobile’s exclusive version of the racing game will be optimized to interact with a MOGA™ Mobile Gaming System, bringing an immersive, console-quality gaming experience to the palms of T-Mobile customers’ hands. The Galaxy Note II also enables T-Mobile customers to bring their entertainment to the big screen by wirelessly sharing content, such as games, movies and TV shows on their smartphone, to any HDMI-capable TV via the AllShare Cast feature and AllShare Cast Wireless Hub accessory. The AllShare Cast Wireless Hub accessory is currently available in T-Mobile retail stores and at www.T-Mobile.com for $99.99. Building on the Premium Suite of productivity features offered with the original Galaxy Note, the Galaxy Note II delivers an even more robust portfolio of tools for business professionals. The enhanced S Pen™ gives users a more precise and natural writing and drawing experience, making creativity and collaboration a breeze. New applications for the S Pen, such as Air View which gives the ability to preview content simply by hovering the S Pen over an email, calendar entry, image gallery or video, helps Galaxy Note II users get more done – even faster. The Galaxy Note II is a SAFE (Samsung Approved for Enterprise) device, providing the ability to securely sync corporate email, calendars, contacts and sensitive information. In addition, the Galaxy Note II includes T-Mobile’s Wi-Fi Calling feature making it easy for T-Mobile customers to make and receive calls no matter where life takes them. The Samsung Galaxy Note II will be available in Titanium Gray and Marble White color options. The smartphone is expected to be available nationwide at T-Mobile retail stores, select national retailers and dealers, and online via www.T-Mobile.com in the coming weeks. SOUTHFIELD — Verizon Wireless announced today that Marquette, Michigan, will become the 400th market to receive high-speed mobile broadband service with the expansion of its 4G Long Term Evolution (LTE) network on October 18. The company will also expand to Monroe, Allegan and Ionia counties. With this statewide expansion, the company reaches a significant milestone, having invested $2 billion in its Michigan network since the company was formed in 2000. With the new and expanded areas, the Verizon Wireless 4G LTE network will be available in 417 markets across the United States, surpassing its goal to cover 400 markets by the end of 2012. The company also announced that 4G LTE service will be launched in Petoskey by the end of the year. On Thursday, Oct. 18, customers who visit or live in the newly expanded areas will be able to surf the Web, stream music and video, and stay in touch with family, friends and colleagues, all with speeds up to 10 times faster than 3G. For businesses using the network, the increasing spread of broadband connectivity provides the most sophisticated wireless capabilities for economic advancement. With the expansion of Verizon’s network across the state, residents can also take advantage of HomeFusion Broadband, a high-speed Internet solution that can be installed at homes for people who live in areas with limited options. In real-world, fully loaded network environments, Verizon Wireless’ 4G LTE customers in the coverage area should experience average data rates of 5 to 12 megabits (Mbps) per second on the downlink and 2 to 5 Mbps on the uplink. Verizon first introduced its 4G LTE network in Michigan in late 2010 to parts of Oakland and Macomb counties. Since then, the company has expanded its 4G LTE network to include the following markets: Ann Arbor, Battle Creek, Bay City, Flint, Grand Rapids, Kalamazoo, Lansing, metro Detroit, Midland, Mt. Pleasant, Muskegon, Port Huron, Saginaw and Traverse City. The company plans to offer full nationwide coverage everywhere it has 3G coverage today by the end of 2013. LG Electronics USA and T-Mobile USA, Inc., announced that the LG Optimus L9 smartphone will be available this fall. Built with a sleek, stylish frame that is only 0.36-inches thin, and surrounded by premium metal trim to provide designer-level styling, the LG Optimus L9 is the latest in the style-focused L-Series of smartphones from LG. Following other popular L-Series phones, such as the Optimus L3, L5 and L7 that were released globally earlier this year, all L-Series phones are designed around five primary aesthetic elements: Modern Square Style for comfortable grip, Floating Mass Technology for a slimmer look, Seamless Layout for a more intuitive arrangement of keys, Harmonized Design Contrast utilizing metallic accents and Sensuous Slim Shape that naturally draws the user’s attention. LG Optimus L9 features Android 4.0 Ice Cream Sandwich and a gorgeous 4.5-inch qHD Corning Gorilla Glass 2 display for bright colors and clear text. LG Optimus L9 is equipped with a long-lasting 2,150 mAh battery so users can watch video, listen to music, explore the Internet or chat with friends and family for hours with just one charge. LG Optimus L9 also features LG QuickMemo, a smartphone experience with powerful note-taking capabilities that lets users add commentary, notes and drawings to screenshots with a few swipes of a finger, then share them with friends and family via social media and email. LG Optimus L9 provides users with a five-megapixel camera and true-to-life 1080p HD video recording capability, so all of life’s important moments can be captured with clarity. For spontaneous photo-worthy events, the LG Optimus L9 lets users snap photos while simultaneously capturing video and take advantage of voice-activated photos using “Cheese Shot” by simply saying “cheese” to snap a picture. LG Optimus L9 features a suite of connectivity technology. Whether it’s streaming high definition movies over T-Mobile’s 4G network, sharing a data connection with up to five devices using LG Optimus L9 as a Portable Wi-Fi Hotspot via T-Mobile’s Smartphone Mobile HotSpot feature with a qualifying rate plan, or making calls over a Wi-Fi network with T-Mobile’s Wi-Fi Calling feature, LG Optimus L9 has the wireless capabilities to keep users connected virtually wherever they are. T-Mobile USA, Inc. and Nokia today announced the upcoming availability of the Nokia Lumia 810 — an exclusive to T-Mobile. The new Windows Phone 8 smartphone offers an enhanced camera, simple design and integrated navigation features. Featuring a 4.3-inch OLED WVGA Clear Black display, the Lumia 810 offers high-end performance in a compact package. The new smartphone is powered by Windows Phone 8, making it easy for users to personalize their device and experiences and always stay connected to friends and family. T-Mobile will offer exchangeable shells in cyan and black, which will allow the device to take advantage of Nokia’s convenient wireless charging solution. With an 8-megapixel camera engineered with Carl Zeiss optics, the Lumia 810 takes crisper and sharper pictures, bringing memories to life. The device also features a new 1.2-megapixel Skype HD certified front-facing camera, providing a high-quality mobile video chat experience. With the Lumia 810, users can capture, share and relive life’s moments with new camera features such as Cinemagraph, a lens that creates animated GIFs, as well as panorama settings and Group Shoot, which allows the customer to choose the best faces and smiles from a burst of photos and stitch them together to produce the perfect group shot. The Lumia 810 also comes with new and enhanced navigation features including Nokia City Lens, which overlays information about restaurants, shops, hotels and more on the surfaces of buildings, providing a new augmented reality experience. The smartphone also provides a comprehensive, integrated mapping experience through new enhancements to Nokia Drive, a voice-guided, turn-by-turn navigation system, as well as through Nokia Transit, which provides directions to a location using public transportation. The Lumia 810 also comes with Nokia Music, which features playlists that are curated by an expert team of global and regional musicologists, spanning a wide spectrum of music genres. Completely advertisement-free, and requiring no registration or subscription, Nokia Music allows consumers to enjoy the songs of their favorite artists without disruption. Nokia Music can also be enjoyed offline so consumers can listen to their favorite playlists anytime, anywhere. The Nokia Lumia 810 is expected to be available in the coming weeks. For more information on T-Mobile’s devices, visit http://www.t-mobile.com/. For more information on T-Mobile’s Unlimited Value and Monthly4G plans, see: http://family.t-mobile.com/phone-plans. iPhone 5 vs. Galaxy S3 review: Who wins the battle between the two hottest smartphones on the market? After endless rumors, Apple’s latest smartphone -- the iPhone 5 -- is finally out. 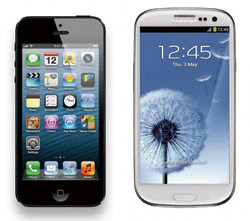 Rather than just do a straight iPhone 5 review, I’ll address something more topical -- the hot topic that’s being discussed everywhere right now, including coffee shops, television ads and everywhere online: Which smartphone is better — the brand new iPhone 5, or the recently released Samsung Galaxy S3? I happened to have my hands on both at the same time (a Verizon iPhone 5, and an AT&T Galaxy S3), so I’ll run down the comparisons between the two and let you know how the two most well-known super-phones on the market compare. First, let’s talk about screen size. The iPhone 5 has grown, it’s up to 4 inches; the first size upgrade since the phone debuted. This means a taller, larger screen that iPhone fans have been waiting for. This is better, but not as much as I would have wanted. Even at 4 inches, I find the keyboard to be a bit small for typing. If you want real size, the GS3 has the numbers – 4.8 inches to be exact. This is more real estate for your viewing pleasure, though some folks might not want a phone that big. It’s up to each person to decide how big is too big, but I think most people will be just fine with a 4.8 inch screen, which is a little more manageable than the 5-inch plus screen on phones like the Galaxy Note and the LG Intuition. In terms of materials, the iPhone wins this battle; it’s more solid and less plasticky, an Apple hallmark. But don’t think the GS3 is a slouch here. It will withstand some drops too, it’s just not quite as sturdy as the iPhone. To be safe, with either phone, get a case. Slimness is close, but iPhone wins out by a hair … 0.30 inches for iPhone, 0.34 inches for GS3. The difference is negligible, as both are very slim and light. Full specs are as follows: The iPhone comes in at 4.87 inches high, 2.31 inches wide, .3 inches thick and a weight of 3.95 ounces. The GS3 is 5.38 inches high, 2.78 inches wide, .34 inches thick, and weighs 4.7 ounces. In terms of what you’ll see on screen, both devices offer sharp visual quality for viewing media and photos and video. With the iPhone 5, you get their well-known Retina display on the 4-inch touchscreen. There is a 1136x640 resolution, or 326 ppi (pixels per inch). There is a fingerprint-resistant coating on the front, but it didn’t really work in my experience. I still found myself wiping my fingerprints off the phone regularly. In the GS3, you get a slightly better resolution of 1280x720, but due to the larger 4.8-inch size the ppi is slightly less. The HD Super AMOLED screen on the GS3 is very bright and attractive. This is one area where I would call it a push between the two phones. The numbers are slightly different, but both look amazing. The iPhone 5, no exaggeration, is lightning quick. Apple did a bang-up job with its dual-core Apple A6 processor, and you won’t be waiting long to do anything. In the area of RAM, the iPhone 5 features 1 GB, but the GS3 features a whopping 2GB of RAM. This is going to become the new standard for smartphones, and the iPhone 5 will be seen as behind in this area, though Apple will argue its operating system requires less RAM to operate than the Android OS. You can get the iPhone with various storage levels -- 16, 32 or 64 GB; of course, that’s what you get, no upgradability in the iPhones. The GS3 is available in 16GB or 32 GB options, plus it has a microSD slot, which allows for up to 64GB, so the potential for more storage space is there on the GS3. Realistically, though, most people don’t need to go past 64 GB, or even that high, especially with so much data and music, etc., stored in the cloud these days (For example, all your music could be stored online in iTunes or Google Music, so it wouldn’t take up space on your phone). The big news about the iPhone 5 is that it’s (finally) capable of accessing the 4G networks of its carriers, another example of Apple showing up fashionably late to the party. That is big news for Apple fans, who now will get faster downloads and uploads as a result. But as Apple’s competitors are quick to point out, that’s old news for Android phone users. They’ve been using the faster 4G LTE networks for over a year now, so in this area Apple is just catching up to the Android competition. The iPhone is offered on Verizon, AT&T, and Sprint, who all have their own 4G LTE networks. Verizon and AT&T’s networks are the most expansive right now, and Sprint’s is newer so its reach is limited. More and more these days, people skip the standalone digital camera and rely on their smartphones. As a result, there are high expectations in this regard. Good news: Both the iPhone 5 and the Galaxy S3 have fantastic cameras, and fantastic video quality too. Both devices have an 8-megapixel camera in the rear, as well as crystal-clear 1080p HD video that looks amazing and life-like on replay. They do well in low light, for the most part, compared to previous versions of these phones. In the area of front camera, which is used primarily for video chat, the GS3 does a little better with its 1.9-megapixel camera. The iPhone 5 front camera comes in at 1.2 megapixels. Both phones’ front camera feature 720p HD video quality. Both phones have a great deal of editing/cropping/sharing ability in regard to photos, as was as various modes such as burst mode and panorama to choose from. To be fair, the Android phones have had the panorama shot for a while, and it’s now becoming available to iPhone users with the latest update to Apple’s operating system. In addition to the change in size, a major update on the iPhone 5 is the new size of the charging connector – the newly named Lightning connector that is a lot smaller than all previous Apple chargers. A connector is included with your phone, but if you want to connect your iPhone 5 to your old iPhone accessories, you’ll need a new Lightning adaptor – which, in true Apple fashion, they’re willing to sell you online for only $30 (yes, a bit ridiculous I know). One big software change on the iPhone 5 is that Apple now relies on its own maps, and no longer uses Google maps. There have been some major bumps in the road for Apple in this transition, especially in Europe, where mapping is just way off. Even in the U.S., some folks aren’t happy with how the new maps work. This is a work in progress, and a result of Apple trying to distance itself from its rivals (Google is behind the Android operating system, hence the distancing), so for now and probably a long time, the GS3 has the edge in terms of getting you where you need to go properly. If I were a user of the new iPhone, the downgrading of the navigation capability of my phone would be very annoying. They’d be better of just going online and visiting Google Maps and leaving the Apple navigation alone completely until they work out the bugs in this transition. Point blank, Apple’s weakening of its maps feature is the biggest disappointment on the iPhone 5, and a big win for the Galaxy S3 in comparison, as Google Maps work wonderfully on it. Of course, behind all this other mess, it’s really – for a lot of folks – all about the apps. Apple, of course, was out with its iPhone before Android phones ever hit the market, so they got a big jump on the competition in terms of having better app selection. And it’s true that pretty much whatever you need to do with an app, Apple’s got you covered on the iPhone. But that doesn’t necessarily mean the Android competition loses this battle. It may have gotten a later start, but in the past several years Google’s Android Market (now referred to as the Google Play Store) has grown by leaps and bounds, and I would say at this point it’s caught up to Apple’s App Store in terms of offering whatever you might need in the app department. In the past, the apps battle was a clear win for Apple, but I think those days are over. This is really the big difference between these two phones. Apple’s iPhone 5 runs the latest version of Apple’s operating system – iOS 6. This features integration with Apple’s ecosystem – iTunes, iBooks, etc. When you use an iPhone, you’re in Apple’s world. Some people like that, others don’t. With the Galaxy S3, you get Android 4.0 (aka Ice Cream Sandwich), and an update promised soon to Android 4.1 (aka Jelly Bean), and you’re in Google’s world here – Google Maps, Google Voice, Gmail, etc. The operating systems operate quite differently in my experience. I find the Android OS more easily maneuverable than iOS 6, for basic reasons such as the presence of a pull down menu listing your apps in use, and the presence of a back button on the phone instead of having to hunt for an arrow within each app to return to the previous screen. Other little things bother me about iOS 6, such as the more difficult steps you must take to sign out of some apps that are operating in the background. Still, I know a lot of folks who love their iPhones and don’t complain about the user experience, so obviously we’re not all going to have the same opinion in this regard. This opinion about operating system preference, to me, is the decision you’ll make that will likely have the biggest impact in determining which of the two phones you prefer. One feature that the GS3 has that the iPhone 5 does not is NFC, aka near-field communication, which allows users of phones that both have this feature to share certain things by simply tapping the phones together, and you can use it to pay for purchases. It’s a very cool feature, though not widely used yet, so I don’t think it will sway too many people from Apple to Android. But, it’s fair to mention that Apple is lagging behind in this exciting new area of smartphone technology, and if they’re smart they’ll make sure to add it on next year’s model. Call quality on these phones will, of course, depend on which network you are using and where you are calling to/from, but in my time with Verizon’s iPhone 5 and AT&T’s GS3, I didn’t experience any dropped calls or distortion or anything of that sort. It would appear to me that the issues previous versions of the iPhone have had with call quality are now pretty much gone. 4G phones are notorious for sucking up battery, but with proper management of your features like WiFi and Bluetooth, you can make them last longer. Samsung’s GS3 slightly outlasted Apple’s iPhone in my testing, and both were among the better 4G phones I’ve seen so far. They got me through the day and then some, unless I was just going crazy with my app use. One small change on the iPhone 5 comes in the area of accessories, as a new variety of earphones are included — called EarPods. As you can guess, they fit better in your ear. Hardly revolutionary, but I suppose they do feel a little better in the ear. The star feature of the iPhone 4S was Siri, your personal assistant who will answer any question you ask – sometimes accurately, sometimes not. She’s a little better this time around, and still has a little wit in her, but Samsung also offers something similar on the GS3 – called S Voice. It’s got its own bugs, too, just like Siri, but both of them allow you to ask questions, open apps, make calls, etc. Some consider S Voice to be a clone of Siri, but that’s for the courts to settle (Apple and Samsung will likely be suing each other into the next century over various copyright cases). To the user, I’ll just say this: Both Siri and S Voice do what they’re supposed to do – for the most part, but with a few hiccups that will likely be worked out on future updates. Siri maybe gets a slight advantage, but it’s not by much. The pricing for the iPhone 5 is the same on Verizon, AT&T and Sprint: With a new 2-year-contract, you pay $199 for the 16GB version, $299 for the 32GB version and $399 for the 64GB version. Costs for the Samsung Galaxy S3 vary by carrier: On both Verizon and Sprint, it costs $199.99 for 16GB version, $249.99 for 32GB version, with new contract; on AT&T, it’s $199.99 for 16GB version (and refurbished GS3s are just $99.99) with a new contract; and on T-Mobile, prices are now $99.99 for 16GB version and $149.99 for 32GB version, with a new contract. This is to be expected, as Apple never adjusts its pricing (at least until the next model comes out), but with the Android phones you can sometimes catch a break at the point of purchase. Personally, I think the $399.99 price out of pocket even with a contract is a bit ridiculous, but I doubt most people would go that route anyway, as 64GB is not needed by 90-some percent of buyers. As Samsung and Apple battle in the courtroom over copyrights and the billions they are making, the battle between these two superphones is now officially under way, as the iPhone 5 is finally here to compete with the Galaxy S3, which had been dominating the market for the past several months. My final verdict is that these phones are very close in overall performance and quality, but the undeniable truth is that the iPhone 5 is finally catching up to its Android competition – namely the Galaxy S3. Most specs are very close between the phones, but the Galaxy S3 has some features that you can’t do with iPhone (NFC) and better maps/navigation. Both phones are very fast, have 4G access, great cameras and video, and it’s a safe bet to say these are the two best phones on the market right now. Really, in the end, it all comes down to what is your favorite operating system and how big you want your phone to be. Some people (aka Apple fanboys/fangirls) swear by Apple and herald the greatness of iOS 6, which I recognize does have some solid upgrades. But others (aka Fandroids) believe that Android’s OS is far superior and easier to use. In my book, the Galaxy S3 is slightly ahead in this battle, but those who swear by the iPhone likely won’t agree with me. Still, I recommend they check out the alternatives though before committing to the iPhone 5. The iPhone may still be a great phone, but we’re long past the day where it was assumed to be the best phone on the market. That only lasted a couple years, really. This time around, the Galaxy S3 gives the iPhone 5 a good run for its money, and is arguably better, so I would recommend all new smartphone buyers contemplating buying either phone try out both and see what side of the argument they choose to be on. Check out his blog at realtechtime.blogspot.com. Autumn is here and many are looking forward to planning a drive to view the beautiful fall foliage. This autumn, Verizon Wireless recommends the following apps to help make the most out of leaf peeping season. -- Users can make foliage reports by posting photos, writing comments, and rating foliage status for their location. -- Available on Android, iPhone and iPad. -- Audubon Trees—A Field Guide toNorth American Trees can help any leaf peeper become a tree and leaf expert. -- This apps lets users browse and identify trees and leaves by shape, family, and name, and comes with an advanced search option. -- Once a user has identified the shape, users can find specific leaves and read all about it. -- Users can then share findings on Facebook, and even report the sighting in the app. -- Available on iPhone, iPad, and Android. -- This app offers thousands of bed & breakfast options for those looking for a quaint place to stay duringtheir leaf peeping trip. -- Offers detailed information oneach property with photos. -- Helps users locate inns aroundthem, or offers search function by city and state. -- Provides instant access to contact the inn for reservations. -- Available on iPhone and iPad.